Lyon star Memphis Depay has driven Manchester United fans into a bit of a frenzy with a post on his Twitter on the day of the Manchester Derby. 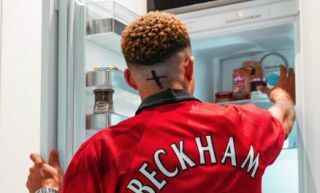 Having scored a stunning free-kick for Lyon in their last game, the Dutchman posted a photo of himself sporting a Man Utd shirt with ‘Beckham 7’ on the back. Of course, Becks was pretty famous for his sublime free-kick strikes in his United days, but these MUFC fans have taken this to mean a bit of a hint he wants a return to Old Trafford. Many are tweeting Depay with messages saying things like ‘once a red, always a red’ and ‘come home’. It’s fair to say that, while the former Red Devil struggled in his brief stint with the club earlier in his career, he has looked hugely improved since moving to Lyon. The 24-year-old has seven goals and six assists already this season, and has scored 30 goals in 87 games for the Ligue 1 side in total since he joined. United could do with that kind of threat in their attack, with the former PSV youngster perhaps just not ready to be a regular for the Premier League giants when he joined a few years ago. Yes lad. Ready to comeback to OT? Once a a red , always a red ???? @Memphis I'd like to have a Manchester shirt with your name on it. And your signature, too. My size is M. Thank YOU 🙂 Seriously, you are great player. I hope you come back one day.